Uma was born in India and attended Osmania University in Hyderabad, India where she obtained a Masters in English Literature. Uma is dually certified in the Primary and Elementary Montessori teaching curriculum from the North American Montessori Center. 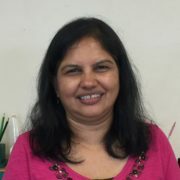 Uma began teaching in 2000 and feels the most exciting and effective parts of the Montessori curriculum are the concrete presentations of math and geometry lessons. Uma has a 27-year old son and a 21-year old daughter. She lives in Johns Creek with her husband and mother-in- law. She loves to cook and listen to music. She hopes to someday visit Australia and Mediterranean Europe.